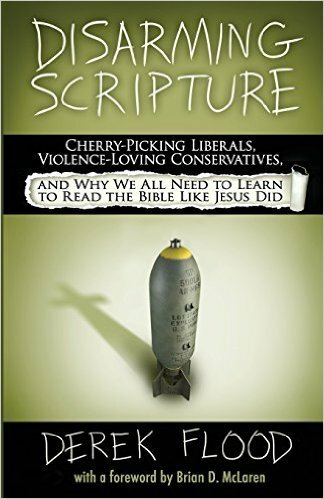 So begins Disarming Scripture by Derek Flood, subtitled ‘Cherry-picking liberals, violence-loving conservatives, and why we need to read the Bible like Jesus did’. Several solutions have been offered to me over the years, and perhaps offered to others by me. ‘The sin of these people was so bad that God needed to cleanse the land of it completely.’ ‘This was the most loving thing for God to do; letting the people live would have resulted in an even worse situation.’ ‘God is God, and whatever he does is good, therefore these violent actions are also good.’ ’Jesus only shows us part of the picture of what God is like; we must also factor in these violent passages to get a full revelation of God’s holy character.’ Evangelicals are taught (conditioned?) to humbly accept what they are told by their leaders, and for the most part I believe this is good and have tried to do so. However when subjected to close examination, some of these statement are downright unscriptural (e.g. compare the last statement with Hebrews 1:3), and all extremely worrying. As an aside it is worth noting that the problem is magnified by the doctrines of the inerrancy and infallibility of Scripture. These concepts are not part of the historic dogma of the church but rose to prominence in the 19th century as an understandable but in my view misguided reaction to enlightenment thinking and scientific discoveries which challenged the authority of scripture. The Orthodox Church have far less issues with the violent passages of the OT (or the Revelation of St John) as they believe that the revelation of the Gospels ‘trumps’ all other scripture. In Disarming Scripture, Derek Flood argues convincingly that we cannot endorse the violent portrayals of God in scripture, nor simply ignore them. Just as it is unacceptable to use scripture to justify bloodshed in God’s name, it is equally untenable to pretend these passages are irrelevant and simply whitewash over them. The so called liberal and fundamentalist approaches do not do justice to the sacred text. Flood’s solution is that we must learn to read the Bible in the same way Jesus did. He presents many examples of the way Jesus challenged in his teaching and life the traditional interpretation of scripture and subverted its meaning completely. To give just one instance, when Elijah calls down fire from heaven to consume his enemies, the OT presents this as evidence that he was acting as a ‘man of God’ (2 Kings 1:10). But when James and John want to do the same (Luke 9:54) Jesus rejects this spirit as belonging to the devil. Flood also devotes a chapter to the Apostle Paul’s conversion from violence and how this is manifested in his message. For example 1 Cor. 15 uses verses from the prophet Hosea to proclaim a defeated death and an end to the victory of sin through the resurrection of Jesus. But the original verses describe a killing spree where compassion is hidden from God’s eyes and even unborn children and killed along with their mothers. In these and many other examples we see Jesus and Paul taking OT scriptures and interpreting them in a way which is redemptive and transformative, resulting in disarmament of the texts. Rather than focussing on the ‘correct’ way to interpret the text, taking all the data into account, harmonising everything and making everything balance out, both Jesus and Paul employed a faithful questioning of scripture, interpreting it in the context of the redeeming and transforming love of God. We would have to say that neither Jesus nor Paul regarded all scripture as faithfully representing the character and will of God. In so doing they show us the way to approach scripture which neither defends nor ignores the violent passages but redeems them. There are several other chapters in this book which deal with reading the Bible in the framework of its trajectory towards the revelation of Jesus, the role of the state in ‘bearing the sword’, what it means to love your enemies, and un-doing judgement. In the final chapter Flood concludes by rejecting the moral bankruptcy inherent in unquestioning obedience and its contemporary expression in authoritarian Biblicism, and argues for the better way of reading the Bible like Jesus did: faithful questioning motivated by compassion. Derek Flood is a writer, artist and theologian. He holds a master’s degree in systematic theology from the Graduate Theological union, and is a featured blogger for the Huffington Post and Sojourners Magazine. Derek blogs at The Rebel God http://www.therebelgod.com/. To hear an interview with Derek try the Nomad podcast at http://www.nomadpodcast.co.uk/nomad-81-derek-flood-how-to-read-the-bible-like-jesus/ (to jump over the presenters’ banter start at 9 minutes and 30 seconds). Disarming Scripture is published by Metanoia Books. Appreciate the overview. Will check this book out! Perhaps another for my fast increasing reading list! Of all these books I’d recommend starting with Brad Jersak’s. It’s also available on Kindle. Flood’s book is one of my favorites, along with Peter Enns’ books. I have my wife reading it now.